This is a very high quality pair of decanters. They would have been considered expensive when they were made because they are much heavier than the standard model - and glass was sold by weight at the time - c.1800. Indeed the average full-bottle decanter weighs about 700 - 800 grams but these are about 1,500 grams each, as they are blown from thicker-than-normal glass, which itself is highly refined. The decanters are of squat club shape with panel-cut shoulders and necks and broad fluted bases. The necks each have integral-cut neck rings - they are not applied, but cut into the thickness of the glass. They are fitted with (original) star-cut mushroom stoppers which have facet-knop shanks and a single prism-cut band around their edges. 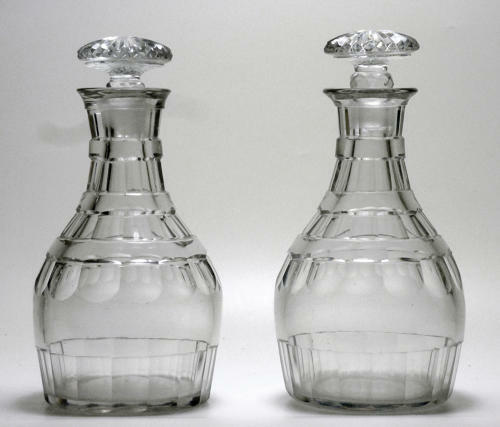 The decanters hold a full bottle each, pour well, and are devoid of any chips or cracks, added to which they are bright and clear. Fully functional and ready to go, they are to be commended!